City of Women may take place in 1943 Berlin, but it is not your typical WWII Holocaust book. There are no concentration camp horror stories in this book. City of Women focuses on the German women left behind in Berlin, their German husbands off fighting on the front lines. Sigrid and Kaspar Schroder lived in a small apartment which they shared with Kaspar’s mother. Each morning Sigrid would ride the bus to the patent office where she worked as a stenographer. After work, whenever possible she would avoid going straight home to the unpleasantness of her mother in law and escape to the movie theatre. It was at the movie theatre that she met Egon, a Jewish man who was to become her lover. It was in the theatre mezzanine that they shared their first kiss. It was also at the movie theatre that Sigrid became involved with Ericha, a young girl who was working for the underground, an organization helping Jews to escape to safety. We watch as Sigrid begins to see clearly for the first time what is happening around her and struggles as to what to do about it. City of Women gives you a very different perspective on this horrific time in our history. There is no black and white. Not all Germans are evil. Not all Jews are innocent. It gives you a better understanding of why people did the things they did. Why some people became heroes and others traitors. It makes you question what you would do if put in the impossible position too many found themselves in. I listened to the audio book, narrated by Suzanne Bertish and found it to be a thoroughly thought-provoking 4 omelet book! Hi Susan. I agree. 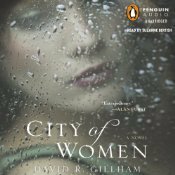 City of Women was a fabulous audio book.